Last month, fifteen states reported major changes in their employment records. The four states reporting over-the-month statistically significant job gains were Florida (+28,000), Arizona and Louisiana (+10,100 each), and Wyoming (+2,200). Why are workers in this state experiencing this influx of jobs? Florida, the state with the highest job growth last month, is happy to announce that this month’s good news is part of a long stretch of monthly job growth. Unemployment in this state is now the lowest it’s been in twenty-one months. This year, 24,900 people have begun jobs that have been newly created. This leisure and hospitality industry is largely the source of these new work opportunities. To keep up with the state’s popularity, many Floridians find themselves working in new jobs in food service and drinking places. There have also been new jobs found in ambulatory health care services and motor vehicle and parts dealerships. The largest over-the-month statistically significant declines in employment occurred in California (?29,200), New York (?24,700), Pennsylvania (?14,200), Michigan (?13,400), and Maryland (?13,300). These figures for changes in a single month suggest how difficult it is to support people who are already unemployed when every month brings more people who need work. 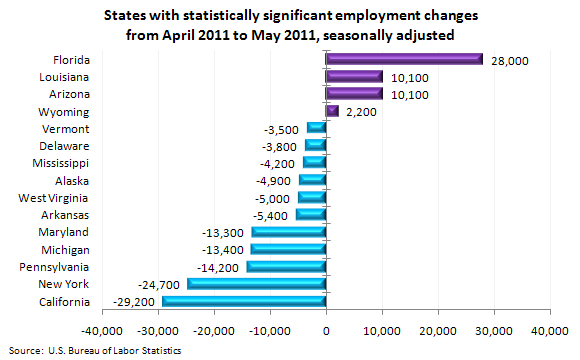 Over the year, 15 states experienced statistically significant changes in employment, all of which were increases. The largest increase occurred in Texas (+205,400), followed by California (+87,300), Ohio (+65,900), Illinois (+61,600), and Pennsylvania (+44,300).